We reported earlier on a rumour circulating that a special 3DS bundle for Fire Emblem: Awakening was on the way to North America. The speculation sparked off after a full page advertisement for the strategic RPG was found in the latest issue of Game Informer, which showed a bundle not too dissimilar to the one Japan received. Nintendo of America has taken to Twitter to confirm that this is official - the special Fire Emblem: Awakening 3DS bundle will be made available in the U.S. and Canada. The bundle comes with the beautiful blue special edition 3DS console which has the upcoming game pre-installed onto the system. The 3DS is not an XL however, which may disappoint those wanting to play the game on the big screen. If you're unfamiliar with the Fire Emblem series and are wondering what it's all about, there's an introductory video explaining the main elements Fire Emblem: Awakening will contain. There will also be a demo of the game in the North American eShop from 17th January. The game itself is released 4th February while Europe must wait until April to play it. What are your thoughts on this new bundle? Will you be getting hold of it or are you disappointed that it isn't a special edition XL instead? Fire-off in the comments section below. Got on just in time to see it at "Posted 0 seconds ago"....aw yeah. Also, exciting news, kind of wish I didn't already have a 3DS...I probably won't buy the bundle, but I am excited to download the game. This is the bundle a lot of people have been waiting for. If I didn't already have a 3DS, that'd likely be the one I'd get. Maybe I should have waited on buying a 3DS for this one. Oh well, I regret nothing. It's beautiful! I hope a lot of people enjoy it. ... If this comes to Europe I'm afraid I'll have to buy this edition as well. This thing's absolutely gorgeous. So, I'll pass. Regardless of it being 3DS vanilla or XL. Besides, in the Washington, D.C. metropolitan area, this thing would be a "oh look at me, I'm so rich" type of item, so it would be thief-bait. Until I saw that the game is pre-installed. I personally require every FE game I own that has can be bought physical to be bought physically. Guess I'll keep my Zelda 3DS. The XL is so much better. Shame it isn't an XL. I wanted this colour and 3DS! It's too bad that I can't get it now, I'll only get a model after the XL that has upgrades on the system though. I love Nintendo, but I am still upset that they took so long to release the cobalt 3DS. I had to get the black one because the blue was just so dang "meh" and then months leater, "Hey look cobalt!" Come on Nintendo. Rant aside, I would be willing to buy this. You would shame the Fire Emblem logo by putting it on something that looks like it belongs in the baby's toy chest, something that they would chew on? February is the month for 3DS clearly. Oh yeah, it has the game pre-installed huh? No dice then after all. Ugh. Since it already has the game installed does that mean I'd be unable to transfer the data from my current 3DS to this one without losing stuff? @TheHunter I got the White 3DSXL with MK7 installed, you just use the System Transfer Tool normally and everything appears licensed correctly on the new device. I even swapped my old device's SD card in [since it was a 32GB one I bought] and could just download MK7 again from my account's downloads on the eShop. @TheHunter No need to worry about that. All you have to do first is link your club nintendo to your eshop. After that, you can start the system transfer. You can just redownload the game. The original is much more attractive to use for special editions. The XL on the other hand looks better plain. Has a price been confirmed yet? This is what it looks like out of the box, it seems more darker blue then my aqua blue 3DS, I would get this, but I already pre-ordered my copy already. Looks really nice. Even if I havent played FE before, I would still get it. I would get this, but I already pre-ordered my copy already. Yeah, pretty much the posistion I'm in. Pretty cool, and it makes me wonder what, if one is made, the Pokemon X/Y 3DS bundle might be. I've not been tempted by a new 3DS until now... I don't think I should waste money on a second 3DS though... Darn you, Nintendo!!! Damn, that is beautiful. I would consider getting it but I am going to hold out until they release a really cool special edition XL that isn't pink. Preferably a green one. I am no longer 100% on this system it just took so long to get a NA release. The XL has a more comfortable control layout. This is pointless! Why bother making regular 3DS limited edition colors? Doesn't everybody want an XL? Common sense would alone should be enough for them to know to make this bundle an XL, not a regular 3DS. hm i might get it depending on price. I wish I had money to burn for this. I don't think I'd actually open it, though. For one, obviously because it's a collectors item. I also am in love with my XL. My son's standard 3DS seems so tiny now. Wish I could get it though because it's very cool. That thing looks sick! The turn off is that the game is pre-installed...I guess I'll stick to my Flame red or whatever one. An XL FE edition would have given me a reason to trade up crom my standard 3ds. Missed opportunity imo. @vegeta044 When you transfer to a 3DS holding a pre-installed game, the accounts just merge with the pre-installed game added to your eShop download list. I've done this with my white 3DSXL+MK7 bundle. Nice one, I just would prefer a XL instead of a normal one and a retail "hard-copy" of the game over the preinstalled one. But on the other hand Im hoping for some awesome bundle with Monster Hunter when it hits europe in march!! DAMMIT! I just bought a 3DS! Oh well, I wanted a red 3DS, anyway. This looks beautiful, but so is my red one with Super Mario 3D Land pre-installed. I don't regret it. Not bothered if this doesn't make it to Europe. The colour/design doesn’t really tempt me, needed something more instantly relevant to FE (like a character silhouette) imo. @IrSasquatch The XL itself is a missed opportunity. Unless your eyesight is poor, there's almost nothing to justify getting one if you have a standard already. I don't get the sudden obsession people seem to have over it. Pretty. Wish it was XL. I should upgrade to XL before FE comes out. Last time I played an FE game on handheld, I couldn't stop playing. If my eyes had started bleeding, the moisture would have been a relief. ...maybe too much detail. Anyway, pretty. This is so frustrating for me because this would have been perfect for me if it was an XL. I am happy for those that don't have a 3DS that is getting it. I want an XL I am just waiting for the right one. 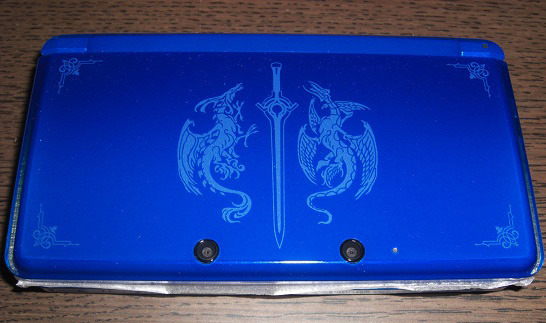 Such a beautiful 3DS. If I didn't already have the perfect Midnight Purple I'd be all over this. This was the color blue system I wanted at launch. I even saw advertisements of people holding 3DSs of this color at the time, but they were strangely absent at launch and I just got a black 3DS. This hurts. I bought my 3ds day one and now cool special editions are coming out. 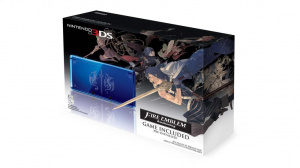 It took me forever to get over not buying a Zelda 3ds and now an awesome Fire Emblem one comes out. Boy would I love this bundle! We shall see what UNCLE SAM leaves me after tax time. I do hate waiting. But Uncle Sam is my last best hope this year for the amount of $$ I need for a 3dsxl. @Mordresh: Thank you. That was my biggest concern..time to go cancel my original Fire Emblem preorder and put it towards the new bundle yay. Yes, the colours are less intense and have more shade (meaning more mature), it has a metallic finish, and that gradation is simply gorgeous, I could use it as a center piece if I wanted. The XL is more intense and tinted (less mature), it has a matte finish, the color is solid, and it is much larger which, with the rest of it, makes it look like it was made for a child that is still getting used to precise control of its hands. Dang, I wish that color was available from the beginning. And that design is just awesome. My only complain is that it's pre-installed. That looks so much better than the Zelda one. I want this. ._. I got a Wii U recently, so unfortunately I'll probably have to skip this one. EFFING FINALLY, I've been waiting and waiting for the localization of this bundle, I can finally give my zelda 3ds to my gf, and get my hands on this perfect piece of machinery. Really don't care if it's a normal 3ds though. so I decided to trade in my aqua blue for this one...however...what will I do if they release a monster hunter edition one? @vegeta044 I was kinda thinking the same thing, but I like a bit more fire emblem and cobalt blue is one of my favorite colors or you can have both if you wanna start a collection. @grimbldoo What are you talking about? 'mature'? They're games consoles. And, in case you haven't noticed, Nintendo targets their games consoles towards children. 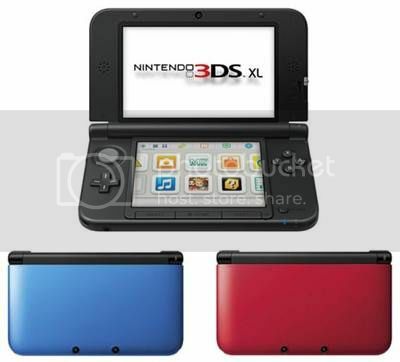 That is why both the XL and the Regular 3DS are mainly sold with bright colours and toy-like designs. The XL is designed to offer a more comfortable gaming experience, with bigger and less reflective screens, longer battery life and curved edges providing the optimum way of playing 3DS games. I am also of the opinion that the original 3DS looks marginally better than the XL, but I don't play Nintendo games to look cool (does anyone?). If this were in a dark shade of blue (something along the lines of the Culdcept 3DS) and I didn't already have a 3DS, I'd run out and get it. The cover design looks great! Are you trolling me right now? Or is your eyesight just bad? Just look at them: comfortable shades of red and cyan, intense but not too bright, smooth gradation, nice slightly metallic finish, smooth curves and softly rounded edges, and a smooth and single film over the SELECT, HOME, and START buttons. I won't even show the Cosmo because you wouldn't be able to counter argue. But look at these, largely rounded edges, tinted red and blue without gradation (I would paint a baby's room with that blue), soft matte finish, and large, slightly rounded and easily clickable SELECT, HOME, and START buttons. First of all, that's not magenta. It's red/crimson. Perhaps it's time for an eye test? You seem to have completely ignored my comment. I said I preferred the look of the first 3DS. Also, the corners are VERY slightly rounded - they hurt my and very many other's palms after extended play sessions. 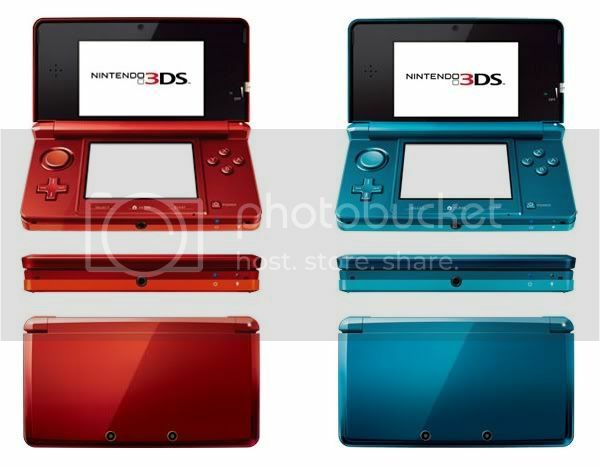 I am not speaking from sight, I am speaking from experience, since I own an aqua blue 3DS (gorgeous shade of blue that) and a blue 3DS XL (also a nice shade of blue, which, incidentally looks rather different from the photo). My sister has the black system, which doesn't look that great to me, since black handhelds don't really appeal to me - I prefer them brightly coloured. Amazingly, I have a baby brother who's room is painted a very similair colour to the Aqua Blue 3DS. I think the point I have to make is that the 3DS and the XL, in terms of visual quality, aren't wildly different. Putting the FE logo on either would not really be much difference. It's still an adult's Nintendo title on a child's Nintendo system. I should also point out the horrible layered design of the 3DS. It looks like Nintendo kept running out of plastic when they were making it. Also the black around the screen on the inside. It just clashes horribly with any colour other than black. Extended, however, it looks much better (XL). Can't believe that I actually wrote magenta down...I corrected it for the XL, but whatever. Thanks for pointing that out. I got an eye test two years ago 20/40, 20/45. It is actually the best amongts my friends who wear glasses :/. Check your first sentence, my friend. I actually don't understand how it hurts people's hands, are you just squeezing it harder than you need to, because that may the problem. I've also never had a hand cramp either, so I guess it really just depends on how you hold it. The visual differences are actually quite obvious. To call it a child's system is not completely true (it may have started as a child's system but it has begun to move past that, games like Monster Hunter are not exactly tailored for children) as it has plenty of games that are for adults (not talking about rating here). No, not really, the way it transitions into clear plastic looks purposeful (and I rather liked it but that's personal opinion). Black, being the neutral color that it is, actually goes well with any other color... which colors it does, however, is up to personal taste (I hate gold/yellow and black but I have friends that absolutely love it). Seriously man? The XL is better in every imaginable way. I can't believe someone would go for the original now that the XL is out (save for the price). Portability - The size difference can be a big difference in your pocket. Guys, your argument is trivial. It started out as light hearted comments. It definitely isn't the way I hold it because no other DS model has hurt in the same way (and I've has them all!) I have ridiculously small hands, so maybe that explains it? Also, compare the look of the 3DS to something like the iPhone, Nokia Lumia, etc. It really doesn't hold up I'm afraid. Nor does the XL though. I also hate how the screen bulges out at the top of the 3DS. #72 I still don't think that it looks so bad it's almost unplayable. The pixellation occasionally gets on my nerves, but most of the time games actually look better. Plus, if you really don't like pixellation, you should probably find another console, because the 3DS has that in spades. I have no problem fitting either 3DS in my pocket - in fact I sometimes take both when I go out! "I still don't think... it's almost unplayable"
That was supposed to refer to the outward appearance of the system. I think that the Cosmo can compete, it actually looks a little elegant (at least to me) and I quite like the "bulge", I guess it really does come down to personal opinion . I actually don't mind the slight pixelation either, but it can be a world of a difference to some people. My pants are kinda tight at the pockets, the 3DS can be uncomfortable at times. Nothing personal here either . @grimbldoo The 3DS never really hurt me too much, although occasionally, after long play sessions, it did bother me a little Especially in games like Kid Icarus and Rolling Western, where the system is supported by the palm! (Thank God the heavier XL has rounder edges)! Pixellation doesn't bother me, on the most part - that's why I have an XL! I do really want a regular 3DS for convenience I gave my Aqua Blue to my brother! FE is out near my birthday in the UK, hopefully they'll release the special edition over here! FIngers crossed, hope you can get one . The blue 3DS looks lovely, but that the game comes pre-installed is rubbish! Nintendo only does this to cut costs! You better buy a seperate 3DS AND a physical copy of the game! I hope Nintendo won't do the same with Wii u: I just want to buy most retail games at retail, as physical copy's! You know, game-card and box! !